Gift or wear a one of a kind piece by adding your words of inspiration to this silver hammered cuff bracelet. 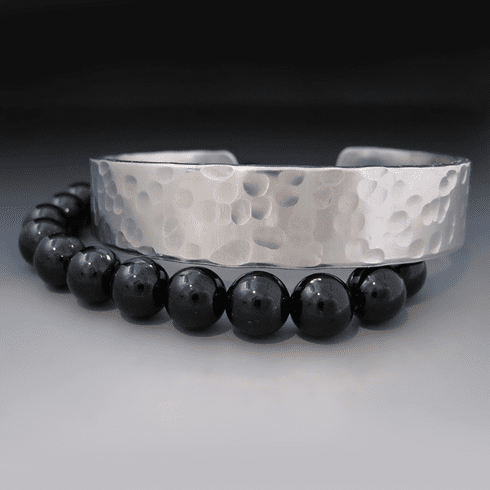 The silver cuff is layered with a black Onyx beaded gemstone bracelet to add depth and dimension. Onyx is the gemstone for the 10th Wedding Anniversary Gift. This black stone is known for releasing negative emotions such as sorrow and grief, therefore manifesting good fortune. It was worn as a protection stone by the ancient Greeks and was used as a way of creating harmony in relationships. This bracelet is 6" long , 2.5" diameter and has a 1" opening for sliding off and on your wrist. It is slightly adjustable to fit most average sized wrists. Need a CUSTOM SIZE? This cuff can be made smaller or larger at no additional cost. Please contact me to discuss your options. The silver cuff 1/2 inches wide and has a 1 inch gap for sliding on and off your wrist. This cuff is made with 100% pure aluminum and will not tarnish or cause reactions due to nickel allergies. It is lightweight and easy to wear. It can be adjusted to fit most women's wrist. The gemstone bracelet is a stretch bracelet. The gemstones are 7-8 mm round. You have the option to personalize the inside of the silver cuff or leave it blank. If you choose to add text you also have the option to add images to the outside edges of the cuff at no additional cost.